You need email for your own email domain. You don’t need the hassle of running your own email servers. 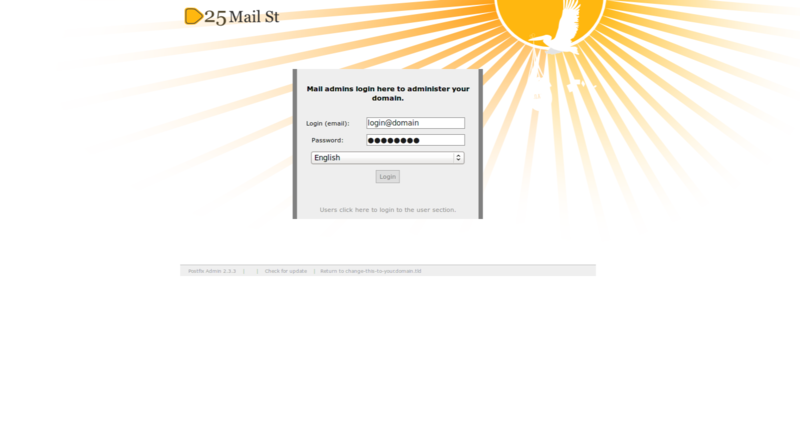 Welcome to 25 Mail St.
Free: 1 mailbox; up to 500MB of storage; up to 200 sent emails; and up to 2,000 forwarded emails. $0.50 USD/mailbox/month for extra mailboxes. $2.00 USD/GB/month for extra storage. $5.00 USDper thousand extra emails sent. $2.00 USDper thousand extra emails forwarded. No extra charge for extra email addresses (cf. mailboxes) or domains. We provide a convenient webmail client (Roundcube) with each mailbox. Web based control panel to setup new mailboxes and manage email address mappings for your email users. Through the bundled webmail client. We use Roundcube, a popular, easy to use and good looking webmail client. Use a regular desktop email client (like Thunderbird, or Outlook). On your smartphone (iPhone, Android, Blackberry, and every device which supports IMAP servers). 25mail.st email client powered by Roundcube. 25mail.st admin interface powered by Postfixadmin. You control the whole email domain. Manage multiple domains in one account. Auto-responders (e.g. out of office messages). Setup multiple user accounts (mailboxes) if you need them. Each with their own email folders. Map one or more email addresses to a user account. e.g. so the sally user gets support@example.com and sally@example.com (or even account@anotherdomain.com). Secure IMAP, SMTP and POP3 access. Using bullet-proof Open Source email service stalwarts like Postfix (SMTP) and Dovecot (POP3/IMAP). Emails stored on RAID-protected disks. Backed up regularly. Spam control (using SpamAssassin). Trainable per user (using Bayesian analysis). Greylisting (to quickly eliminate up to 90% of botnet created spam). Free for 1 mailbox and up to 500MB of storage. $5/month. Includes 2 mailboxes and 2GB of storage. At RimuHosting our staff have spent over 8 years helping our customers setup email servers on their own machines. We helped our customers to select the most appropriate email hosting stack. We have configured each piece of the stack. We got those pieces to work together. And we helped troubleshoot all sorts of tricky problems. From configuration issues. To DNS mail records. In short: we know our techie mail server stuff. Setting up an email server can be hard work. And hard to get right. 25 Mail St. takes the pain out of that by setting the basics up for you. Some people don’t want to use free mail hosting. For everyone else, we can offer a hosted, hassle-free, out-of-the-box, ‘just use it’ email server setup. Sound good? Sign up for a free, no-obligation account. First page after you logn that has links to appropriate pages. List of domains and how many aliases and mailboxes each domain has. List an overview of all mailboxes and aliases. Lets you add aliases to a domain. Create new mailbox for a domain. Login to 25mail.st Round cube client. Inbox and folder view. Also a email preview pane which can be turned on and off. Add contacts into your address book. When editing email field it will auto complete from this list. Change settings in here like filters or view settings. © RimuHosting Ltd 2019. RimuHosting, 25 Mail St. and the 25 Mail St. logo are RedRata™ trademarks.